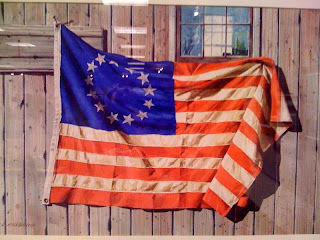 Celebrate July and Independence day with the latest exhibit at the Farmington Library. Artist Gary Kollberg's exhibit features collages and paintings that celebrate America. His complex collages feature antiques and Americana collectibles. Gary Kollberg is largely self-taught, although he studied with Ruth Van Sickle Ford at the Art Institute of Chicago in 1959. He graduated with honors from the Parsons School of Design degree program with New York University. In the early 1960's Kollberg entered the field of Graphic Design as Art Director at the American Institute of Aeronautics and Astronautics. He was responsible for the complete redesign of the Institute Magazine and technical journals as well as promotional material. Kollberg expanded his visibility in the design field with positions such as Design Director with important firms such as Raymond Loewy in New York City, where he was responsible for package design with clients including Nabisco, Brown Foreman, and Corporate Identity Programs for the United States Postal Service, Chubb Insurance, Northwest Airlines, Norfolk Scope, Naussau Coliseum, Exxon and various banks. Mr. Kollberg retired in 2001 and continues to devote enjoyable time to Watercolor painting, and other creative outlets such as Structural Assemblages and Wood Carving.